Even though I knew Butterbear wasn't going to be the most impressive of the bath bombs from my Lush Christmas haul in terms of putting on a show, I think this is the one I was looking forward to using the most. So I left this little cutie until last. This one isn't about lots of pretty colours, glitter and maybe a hidden surprise in the middle but is more about being good for your skin. 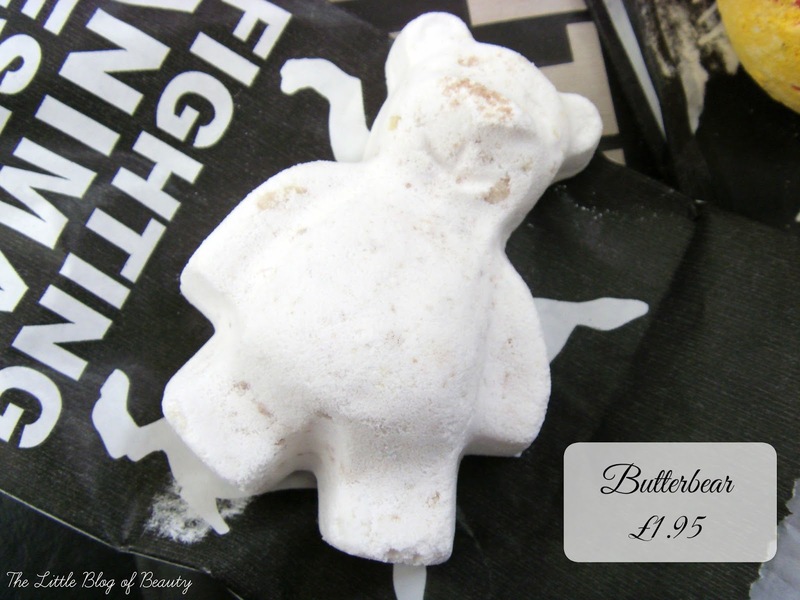 Butterbear has a vanilla fragrance and contains fair trade Colombian cocoa butter, ylang ylang oil and cocoa powder. You drop Mr Butterbear into your bath and he fizzes away turning the water cloudy and releasing a lovely vanilla fragrance, but the cloudiness in the water and fragrance disappears once he's fully dissolved. He releases some little brown specks into the water, I'm guessing this might be the cocoa powder, but that's all he releases and after maybe a minute at the most he's gone. What you're left with is clear water with the little brown specks floating in it but also you can see the oil from this floating on the surface of the water. If like me you've got very dry skin then this is the sort of bath bomb you need as when you come out of the bath any excessively dry and rough patches you have will be soothed and feeling soft. With these sort of bath products I'm always slightly concerned that I'll be left with a oily bath making it slippy, but it just required a quick rinse down to wash away any lingering traces of oil. Although this isn't the most impressive bath bomb this is definitely my favourite as it's very reasonably priced and I feel like I'm actually getting something out of it rather than paying £3/£4 for a few pretty colours. I've been wanting to pick up this little guy for age, I bet your skin feels sooooo soft afterward!